So here ya go Brady Shmady...love you and miss you! 2. Cream the butter and sugar, then add the egg and beat until fluffy. 3. Add sour cream and vanilla and blend well. 7. When cool you can frost with your choice of frosting. I use my Vanilla Butter Cream Frosting, recipe found HERE. *Flour amount can vary based on the altitude and the moisture in the air. High altitudes and dryer climates usually need less flour, but lower altitudes and moister climates need more. ***Your baking time will vary based on the size of your cut outs. Small 2” in cut outs usually only need about 7-8 minutes, where a larger 3-4” cut out may take up to 12 minutes. I would recommend setting the timer for about 7 minutes and watch carefully. 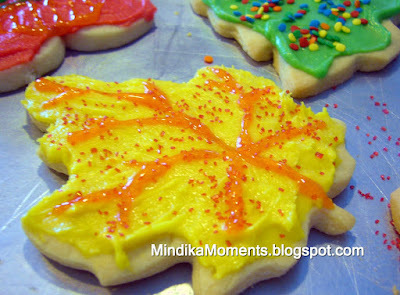 Leave larger cookies in until they start to slightly brown around the edges. Thanks, Mindi! I have not yet made sugar cookies. We're doing it today, and I do not have a recipe I love, so I am going to use this one. Very excited. Oh yum! 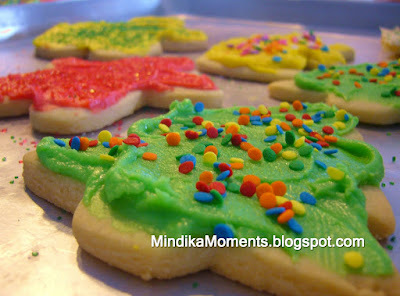 Those cookies are tempting me to make some for neighbors!! Merry Christmas Mindi! Its never too late for cookies!